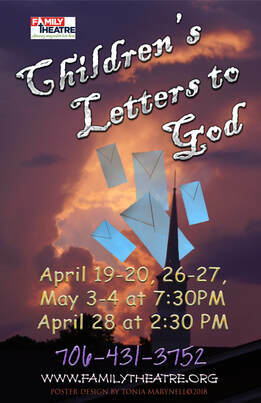 Based on the international best-selling book by Stuart Hample and Eric Marshall, Children’s Letters To God is a musical that follows the lives of five young friends as they voice beliefs, desires, questions and doubts common to all people but most disarmingly expressed by children. Sixteen tuneful songs and assorted scenes (some based on actual letters) explore timeless issues such as sibling rivalry, divorce, holidays, loss of a beloved pet, the trials of being unathletic and first love. This entertaining show carries a universal message which crosses the boundaries of age, geography, and religion.